Okay, I'm tired of all the scooter tag's for the bay area being SF or North Bay! How about one for San Carlos to Morgan Hill??? EDIT: changed the title to identify the area better. me too, me too! I'm kinda in the middle being out on the coast, but I tend to ride more in the south bay since I work down there. I think I even know where this one is! The race is on! Who will get there first???? I don't think I'll be able to get there til early next week, with the bad weather and a trip outta town this weekend, I'm sure someone will beat me to it, though I'm looking forward to keeping this going! I know right where it is...just can't get there today. If it's not taken tomorrow after work, I'll get it. 1 Manual; 1 Auto; none other. Wow . . . Didn't see this one coming. Then again, if East Bay wants one, why not South. Guess a SF/North Bay thread is next. Btw, too easy. I can snag this before work tomorrow. 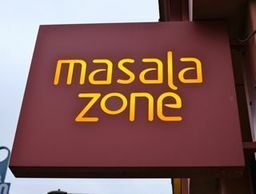 I start at 7a, Masala. Wanna race for it? Nah, man...it's all you - go for it. I should've done it today, but I just got caught up with stuff around the house and time got away from me. There's no way I can do it before work tomorrow - I leave the house at 0530, and I work in Fremont. So I am new to this board. How do we play said Vespa Tag? I don't get my scoot till later in the week, to bad I think I have a good idea where this is by looking at lights and side walk coloring and vta stand? find the tag spot, take a pic with your scooter. post. 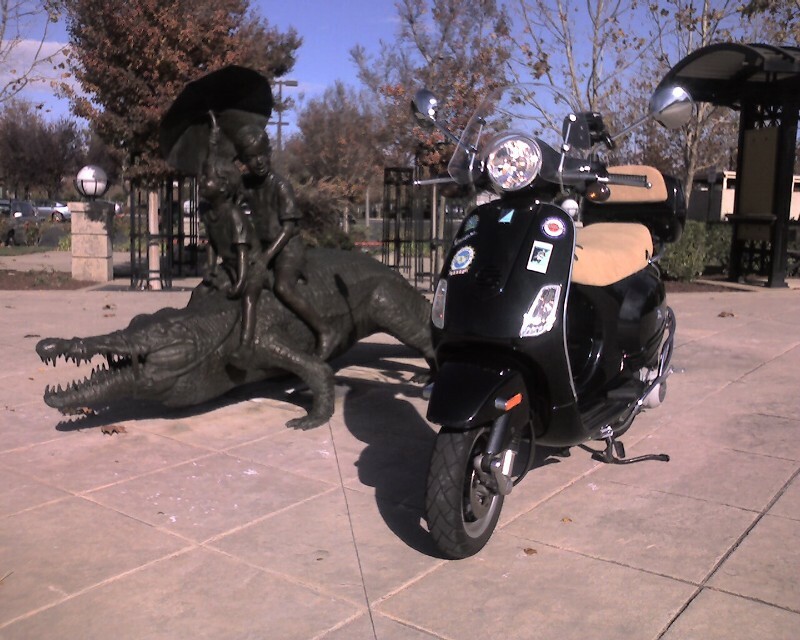 pick new tag spot, take a pic with your scooter. post. As each day passes and no one gets it, you can post a hint. Here's the jist of "rules" to abide by for us. Also, let me take a shot for creating boundaries for SF South Bay. Tell me if one thing or another doesn't work and we'll go from there. * The first person to "tag" the photo by posting their photo with their bike gets to post the next photo for people to find. * Clues are to be given every day after the tag has been posted. If no tag has been retrieved by the 6th day, the location is to be announced. If the tag has not been picked up by the 7th day, a new tag must be submitted. Not like we've been following this rule by much now, have we? It's been cold and miserable out there, so it's forgivable and I don't give a damn. * Put on some miles - you don't need to do that much group riding....It's an unlimited mileage warranty. Get over it. So hopefully no one will post till then. You know what... Go for it. There will be others to come later on. 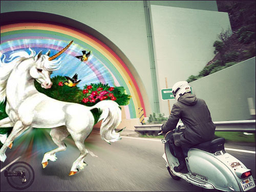 Make it the first thing you do after picking-up your new scoot. Any into doing a lil' Saturday ride to help our new MV brotha' out? actually, depending on if the ride is sunday afternoon (and how long it will be), I may be able to do a ride. We can let Heinzanova decide. Maybe the first day should be a personal day for enjoying it solo. Second day - start using 'it like it was meant to be used! I was talking with the dealer yesterday, and they are actually going to deliver it to me on Tuesday. My GF is leaving town tomorrow early morning and with out her I can't seem to arrange a ride town to Santa Cruz to pick it up Saturday. So for $25 they will bring it from Santa Cruz to my door, maybe a ride next weekend would be awesome. So for $25 they will bring it from Santa Cruz to my door, maybe a ride next weekend would be awesome. Next weekend is VCLG's rally - Classico Moto Italia. Be there! My few friends in this area (implant so I have variable friends) are either going up to Tahoe this weekend or unable to do it during the time frame the dealer is open. Bigger menu, lots more meat, but stupid bread rolls tear up the insides of my mouth. 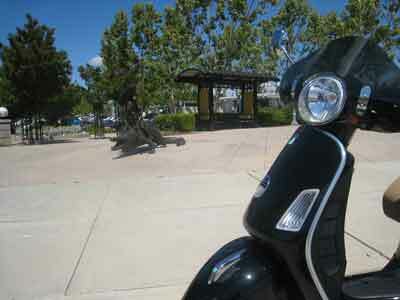 Did you buy your scoot at Vespa Santa Cruz? I may be going over there midday Saturday to pick up stuff for Classico Moto Italia. PM me with your phone number and I can let you know if I'm heading over the hill Sat. Hey CaliGirl I used to live in the Poconos (1 hour north of phili). Figure a nice ride up highway 1 to get it home should be a good warm up. 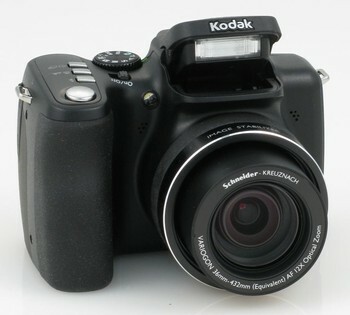 Hey guys, I just picked-up a new toy (Kodak Z812 IS) yesterday and I'm itching for some riding and shootin'. If you wanna join me, you're more than welcome to. Email me and the phone will pick it up. New camera = more pictures, better quality! YAY!!! P.S. I may go as far north as Alice's, FYI. So no scoot until Tuesday, I am on call this weekend, and Mike was generous enough to give me a ride down, but the dealer did not have the right color top case in yet, so I could not fit my work gear in it (thus if something happened while I am riding I couldn't use my air card and VPN in and fix it...). soon as I get it tuesday I am gonna leave work and go tag that bugger... as long as no one else does. If you don't get it by friday I'll have to ride down there on my rabbit and get it. Bunch of slackers. Horsesh*t.... I'm getting it today. Period. What's great is that I'm double dipping while being retired. You comin' down Friday or Sat? I just got back from riding up there to get it - you must've beaten me by less than an hour or so, unless you picked it off early and didn't post until now. Ah, well. I'll look forward to the next one. As for the new guy, trust me - you didn't want to be out on Central Expy with the wind today on a brand new scooter!